WhatsApp is a popular instant messaging and calling tool used internationally. In Brazil it’s use is second to Facebook. A popular What’s App was once again blocked in Brazil on Tuesday June 19th – but yet again overturned – for a third time this year. It is not the first time Brazil blocks WhatsApp services. On May 2nd – it was blocked for 72 hours – overturned earlier. Back in December of 2015, authorities ordered ISPs to block access to the popular app for 48 hours, arguing failure to comply with a data request, that could “aid the authorities in an ongoing investigation”. 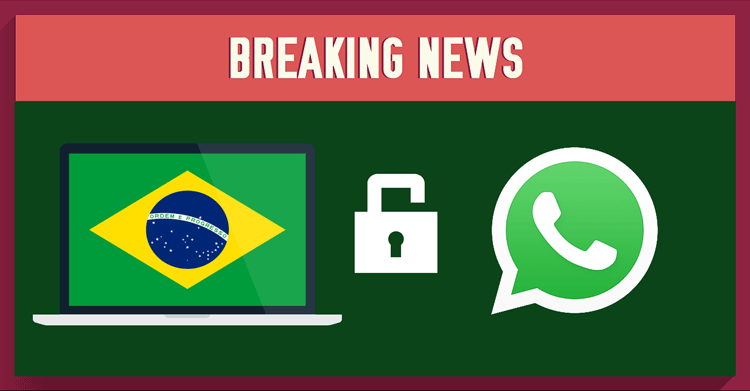 Whats App remains strong in their vow to encryption and say they won’t be able to provide info Brazilian investigators seek. The move comes after the Vice President of Facebook was detained in Brazil back in March after failure to reveal information from WhatsApp services to Brazilian Authorities. VPN is a virtual private network which tunnels your traffic by hiding your IP address and routing your traffic through a VPN server in another location. NordVPN can be set up on an internet enabled device. Install NordVPN application on your device and choose a server, where you want your connection to appear. If you are in Pakistan and connect to the US server on the NordVPN app – you will appear to be in the US. Upon successful connection – your traffic is encrypted and your data is secured – allowing you to browse desired content, like What’s App that you have just unblocked. If you need a short term VPN access – please visit our Emergency VPN access page.